With Stars of David: Rock ‘n’ Roll’s Jewish Stories, Scott Benarde combined his passion for Judaism, journalism and rock ‘n’ roll. The result: a revealing look at what has been, until now, the “stealth” contribution and influence of Judaism on rock music and the people who make it. 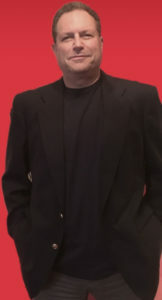 Scott served as the pop music columnist for the Fort Lauderdale News/Sun Sentinel from 1982 into 1987 and reprised that role for the Palm Beach Post from 1987 into 1995. His most popular work at both newspapers was his monthly “YNOT” column, a newspaper column that pretended to be a pirate radio station directing “listeners” to worthy new music they weren’t hearing on the radio. In 1989, Scott co-founded and, for four years co-directed Miami Rocks, Too!, a three-day long showcase of South Florida music talent for national record labels. From 1995 through 1999 he served as a copy editor/feature writer for the Post, during which time he continued to write pop music features. Throughout his tenures at the Sentinel and Post, Benarde freelanced for a variety of music and general interest publications, including Rolling Stone and Billboard, and numerous newspaper travel sections, specializing in scuba diving experiences. He also was a frequent guest on area rock stations and talk radio programs, playing selections from his YNOT column and discussing everything from the year’s Grammy nominees to the effects of violence in music and music videos. He also presented lectures on the music business and entertainment journalism at South Florida colleges, professional, and secondary schools. In 1996, he began writing about Jewish rock stars for Jewish publications such as the Baltimore Jewish Times, Detroit Jewish News, Jewish Journal of Greater Los Angeles, and Atlanta Jewish Times, among others. That year, he also promoted the first of a series of “coffeehouse” concerts at the West Palm Beach Jewish Community Center featuring national acts who are Jewish. The series included Henry Gross, Janis Ian, Karla Bonoff, Peter Himmelman, Lucy Kaplansky, and Julie Gold, among others. In late 1997, Scott began research for Stars of David (the working title at the time was Electric Shofar: The Jewish Contribution to Popular Music 1953-Present). In December of 1999, Scott joined the Communications Department of the Jewish Federation of South Palm Beach County. In December of 2004, he joined the Media Relations and Marketing Department of the Kaplan JCC in West Palm Beach, Fl. Brandeis University Press published Stars of David: Rock ‘n’ Roll’s Jewish Stories in September of 2003. Since then, Scott has given his “Jews and Blues and Rock ‘n’ Roll: A Musical History Tour”presentation throughout the country. In 2007, The Palm Beach County (Florida) School District, in conjunction with the League for the Educational Awareness of the Holocaust (LEAH), began bringing Scott into area high schools to give his provocative “Holocaust and Rock ‘n’ Roll” presentation. The idea was to engage students in the subject “in their own language,” and illustrate how the Holocaust remains relevant and far from ancient history. Later that year, XM Satellite Radio asked Scott to put together eight one-hour shows based on “Stars of David” for its annual week-long Radio Hanukkah channel. The programs, with musical themes such as “Exploring Jewish Identity,” and “Rockers Doing Jewish” were so popular that in 2008, after XM merged with Sirius Satellite Radio, he was asked to update five of the shows for re-broadcast on the new combined satellite radio network. Scott currently serves as Director of Communications for the Norton Museum of Art in West Palm Beach. He and his wife Mindi live in West Palm Beach with their son, Michael Dov, and daughter, Shirah Beth.